We wrote a book! 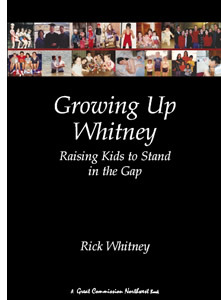 Growing Up Whitney is primarily a testimony. It is our story of how one Christian family has tried to live out this Great Commission. Parenting is hard work! That’s why I wrote. I wanted to help fellow dads, many of whom I may never get a chance to meet, to be the best dads they can possibly be. I’ve tried to fill the book with some of the most important lessons I have learned and shared, across this country. On the back cover I ask the question, “How can you ensure that you pass on to your children your passion for following the Lord and the advancement of His Kingdom?” Throughout these pages I try to answer this fundamental question. Throughout the summer of 2003, I will offer the book at a reduced rate to folks that attend one of our team of churches. If you send us a check for $15, made out to Great Commission Plains, I will send you a copy. As simple as that. And if you do not attend a GCAC church, but would still like a copy, I would love to send you one for the cover price of $19.95. This is still a great value. These books come 24 in a case, and if you are interested in a case lot, we are offering them at $12.50 a book or $300 for a case.